17-Station Tooling Carrousel, 64-Station Secondary Magazine Carrousel, BT-Style Tooling, 16-Station Automatic Chuck Jaw Changer, Tool Presetter(NEEDS WORK), Hydraulic Tailstock, 10” 3-Jaw Power Chuck, Chip Conveyor, Coolant. 1997 Mazak “Super Quick Turn 15M MARK II” Live Turret CNC Turning Center s/n 125315 w/ Mazatrol T-PLUS Controls, 12-Station Live Turret, Hydraulic Tailstock, 8” 3-Jaw Chuck, Coolant. Clark 16” x 60” Geared Head Gap Bed Lathe w/ Sino SDS6-2V Programmable DRO, 25-2000 RPM, Inch/mm Threading, Tailstock, 10” 3-Jaw Chuck, Coolant. Clark 14” x 40” Geared Head Gap Bed Lathe w/ Sino SDS6-2V Programmable DRO, 40-1800 RPM,Inch/mm Threading, Tailstock, 8” 3-Jaw Chuck, Coolant. Roundtower Vertical Mill w/ Sino SDS6-2V Programmable DRO, Power Feed, 9” x 42” Table. Saimp Vertical Mill w/ 110-2720 RPM, 40-Taper Spindle, 10” x 44” Table. 1995 Mazak VTC-20C Vertical Traveling Column CNC Vertical Machining Center s/n 116271 w/ Mazatrol M-32B Controls, Dual 24-Station ATC’s, 40-Taper Spindle, Tool Touch Probe, 20” x 78 ¾” Table, Chip Conveyor, Coolant. 1995 Mazak VTC-16C Vertical Traveling Column CNC Vertical Machining Center s/n 117532 w/ Mazatrol M-32B Controls, Dual 24-Station ATC’s, 40-Taper Spindle, Tool Touch Probe, 16” x 78 ¾” Table, Chip Conveyor, Coolant. 1995 Mazak VTC-16A Vertical Traveling Column CNC Vertical Machining Center s/n 114150 w/ Mazatrol M-32B Controls, 24-Station ATC, 40-Taper Spindle, 16” x 35 ½” Table, Coolant. 1996 Mazak V-515/40 CNC Vertical Machining Center s/n 121023 w/ Mazatrol M-PLUS Controls, 30-Station ATC, CAT-50 Taper Spindle, Tool Touch Probe, 21 ½” x 51” Table, Chip Conveyor, Coolant. 1991 Mazak Mazatech V-414 CNC Vertical Machining Center s/n 92831 w/ Mazatrol M-32 Controls, 24-Station ATC, CAT-40 Taper Spindle, Tool Touch Probe, 19 ¾” x 35 ½” Table, Coolant. Mazak Mazatech V-550 CNC Vertical Machining Center s/n 74255 w/ Mazatrol M-32 Controls, 30-Station ATC, 50-Taper Spindle, 21 ½” x 55” Table, Coolant. Fadal / Union mdl. BFT 90/3-2 CNC Horizontal Boring Mill s/n 0930031 w/ Fadal CNC88 Controls, 50-Taper Spindle, 49 ¼” x 55 ½” Rotary Table. 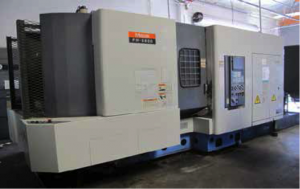 1995 Mazak VTC-16A CNC Vertical Machining Center s/n 112712 w/ Mazatrol M-32B Controls, PARTS MACHINE). Dec-1999 Mazak FH-5800 4-Axis 2-Pallet CNC Horizontal Machining Center s/n 145739 w/ Mazatrol PC-FUSION-CNC 640M Controls, 40-Station ATC, CAT-40 Taper Spindle, Tool Touch Probe, 4 th Axis Thru Pallets, 19 ¾” x 19 ¾” Pallets, Chip Augers, hip Conveyor, High Flow Coolant. 1998 Mazak FH-480 4-Axis 2-Pallet CNC Horizontal Machining Center s/n 134393 w/ Mazatrol M-PLUS Controls, 90-Station ATC, 40-Taper Spindle, Tool Touch Probe, Renishaw Wear System, 4 th Axis Thru Pallets, 15 ¾” x 15 ¾” Pallets, Chip Augers, Chip Conveyor, High Flow Coolant. 1996 Mazak FH-480X 4-Axis 2-Pallet CNC Horizontal Machining Center s/n 126726 w/ Mazatrol M-PLUS Controls, 30-Station ATC, 40-Taper Spindle, Tool Touch Probe, 4 th Axis Thru Pallets, 15 ¾” x 15 ¾” Pallets, Chip Augers, Chip Conveyor, High Flow Coolant. 1989 Mazak Mazatech H-500/50 4-Axis 2-Pallet CNC Horizontal Machining Center s/n 84581 w/ Mazatrol M-32 Controls, 80-Station ATC, CAT-50 Taper Spindle, Tool Touch Probe, 4 th Axis Thru Pallets, 19 ¾” x 19 ¾” Pallets, Hand Wheel, Chip Augers, Chip Conveyor, Coolant. 1990 Mazak AJV-35/80 4-Axis Bridge Type CNC Vertical Machining Center s/n 82923 w/ Mazatrol M-32 ontrols, 30-Station ATC, 50-Taper Spindle, Tool Touch Probe, 29 ½” x 88” Table, Coolant. 1989 Mazak AJV-32/605 Bridge Type CNC Vertical Machining Center s/n 79853 w/ Mazak Controls, 60- Station ATC, 40-Taper Spindle, Tool Touch Probe, 25 ½” x 68 ½” Table, Chip Conveyor, Coolant. Mazak AJV-25/405 Bridge Type CNC Vertical Machining Center s/n 75987 w/ Mazatrol M-32 Controls, 30-Station ATC, 50-Taper Spindle, Tool Touch Probe, 21 ½” x 48 ¾” Table, Coolant. Mazak AJV-25/404 Bridge Type CNC Vertical Machining Center s/n 76059 w/ Mazatrol M-32 Controls, 30-Station ATC, 40-Taper Spindle, Tool Touch Probe, 21 ½” x 48 ¾” Table, Coolant. Mazak AJV-25/404 Bridge Type CNC Vertical Machining Center s/n 75190 w/ Mazatrol M-32 Controls, 30-Station ATC, 40-Taper Spindle, Tool Touch Probe, 21 ½” x 48 ¾” Table, Coolant. 1997 Mazak FJV-25 Bridge Type CNC Vertical Machining Center s/n 127444 w/ Mazatrol M-PLUS Controls, 21-Station ATC, 40-Taper Spindle, Tool Touch Probe, 20” x 51” Table (NEEDS WORK). 1996 Mazak VTC-20C Vertical Traveling Column CNC Vertical Machining Center s/n 120180 w/ Mazatrol M-32B Controls, Dual 24-Station ATC’s, 40-Taper Spindle, Tool Touch Probe, 20” x 78 ¾” Table, Chip Conveyor, Coolant. Blanchard No. 18 Rotary Surface Grinder s/n 8974 w/ Electromagnetic Chuck, Coolant. Chevalier FSG1640AD 16” x 40” Automatic Surface Grinder s/n 0479A005 w/ Chevalier Controls,Electromagnetic Chuck, Coolant. DoAll mdl. C-1216A Automatic Hydraulic Horizontal Band Saw. DoAll mdl. C-1213A 12” Automatic Hydraulic Horizontal Band Saw. Kira Type KYV-3 Geared Head Tapping Machine w/ 15” x 15” Table. Warner &amp; Swasey No. 10 M-2100 Precision Tapping and Threading Machine. Darex Endmill Sharpener w/ 5C Air Fixture. 2011 ALMiG COMBI 22/30-125 30Hp Rotary Screw Air Compressor s/n F1103756/s0013345 w/ Almig Digital Controls, 89.9 CFM @ 125 PSIG. PolarAir / Airbase mdl. PRV0300003 30Hp Rotary Air Compressor s/n 261348 w/ Logik 25-S Controls. Eaton mdl. SRW8-30HP- VSD 30Hp Rotary Screw Air Compressor s/n EC-SRW- 080917R w/ MAM-100 Digital Controls, 123 CFM @ 120/145 PSIG. SnapOn Signature Series Vertical Air Compressor w/ 80 Gallion tank. HE Systems 10Hp Portable Air Compressor. US General mdl. US7580V 7.5Hp Vertical Air Compressor w/ 80 Gallon Tank. 240 Gallon Vertical Air Storage Tank. Yale mdl. GLC070VXNGSE104 5050 Lb Cap LPG Forklift s/n A910V04176C w/ Cascade Split-Fork Attachment, 229” High-Mast Lift Height, Side Shift, Cushion Tires. Yale mdl. GLC070VXNGSE088 5150 Lb Cap LPG Forklift s/n A910V10918E w/ Cascade Split-Fork Attachment, 187” Lift Height, Side Shift, Cushion Tires. Big Joe mdl. 2018-T9S Electric Pallet Mover. Die Lift Carts and Shop Carts.